It is possible to rent a motorbike, scooter or tuk tuk in Arugam Bay but you should be aware that it is not 100% legal. As of now there are no official registered hire providers in the local area. There are however, many locals who will be happy to lend you theirs or a friend’s for around 800-1000LKR per day. There are a lot of accidents caused by poor roads and bad driving. Ensure you have good travel insurance to cover at least your own personal injuries as you will not be insured by the “renter”. A Temporary Driving Permit for Visitors is required by law to drive any vehicle in Sri Lanka as a tourist This can only be obtained in Colombo at the Department of Motor Traffic (opens in Google Maps). The police will at times fine drivers for not having the required permit. This can be expensive, sometimes over 5000LKR. Renters are now sometimes choosing to not rent to people without a permit as they also have to pay some of the fine to the police. The bottom line is that times are changing and the police have realised that there is a chance to make money from unprepared tourists. That said some people rent for a few months and have no problems, some get fined on their first day! 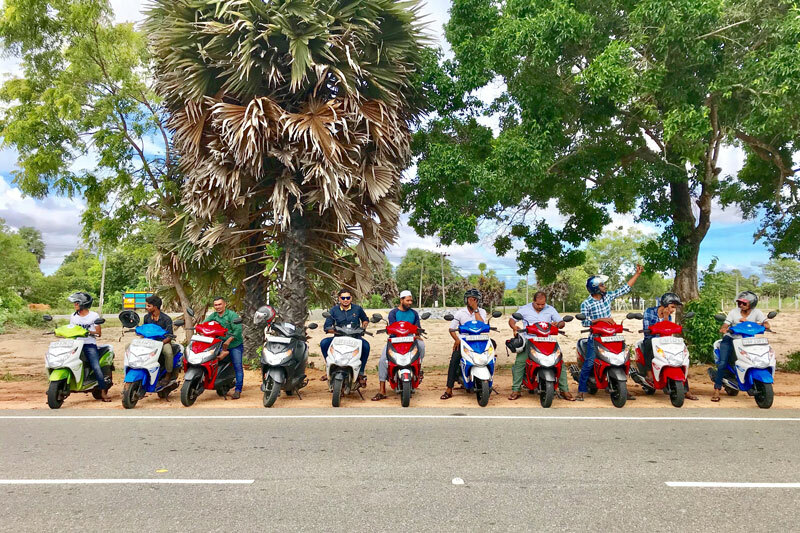 See the business directory for a list of scooter rental agencies in Arugam Bay. Any experiences are welcome in the comments below. Hey Georg, bike racks on scooters are banned in Sri Lanka. Not sure about on bicycles… For accommodation recommendations have a look at the Ultimate Guide to Arugam Bay Accommodation. I live in Bali and I have an International Drivers Licence that states I am allowed to ride a motor bike, is this not recognised in Sri Lanka? Hi Michelle, you will also need the Temporary Driving Permit for Visitors as mentioned above. The International Drivers Licence might work with some police if stopped but others will not accept it. Thank you so much Admin for your quick reply. I had a look at the location of Department of Motor Traffic and it seems far away for the actual time we have in Colombo. I guess bicycles and tuk tuks it is. Do any of the rental bicycles have surfboard racks? We have never seen a bicycle with a surf board rack in Arugam Bay. Also, surf board racks on scooters were completely banned on the South Coast this year but whether that law applies to bicycles too is unknown.